The index opened flat at 8711 and stayed in a narrow range but closed in green at 8726.60, gain of 11.00 points. The broader market was strong with 1092 advances to 531 declines. Range now at 8500-9000. 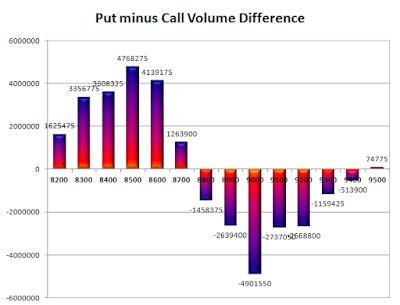 Call option 8700-8800, 9000, 9200-9300 added 12.97 lacs OI with profit booking at 8900, 9100 and above strike prices. Put option 8500-8200 added 11.21 lacs OI with short covering at 8800 and above strike prices. 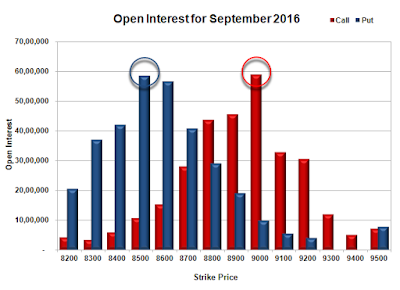 Nifty Open Interest is at 3,26,24,250 down by 1,82,775, with increase in price, probably short covering. Bank Nifty Open Interest is at 22,95,480 down by 22,960, with increase in price, probably short covering. FII’s sold 9001 contracts of Index Futures, which includes net 2045 contracts long liquidation and 6956 contracts short build-up, with increase in net OI by 4911 contracts, includes 21969 longs to 30970 shorts for the day. FII’s Index future open contract as on date is 398656 Longs to 65498 Shorts, Net long 333158 contracts. 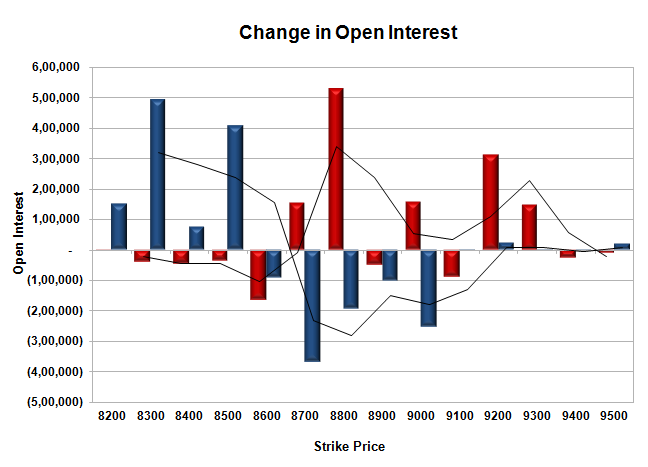 Initial support stays at 8700, with OI of 40.80 lacs and below that at 8600 with OI of 56.66 lacs. Initial resistance at 8800, with OI of 43.76 lacs and above that at 8900 with OI of 45.54 lacs. Day Range as per Option Table is 8657 - 8787 and as per VIX is 8659 - 8794 with 8718 as the Pivot.